The South American part works series have thrown up a number of vehicles which are very similar to those produced in America or Europe. 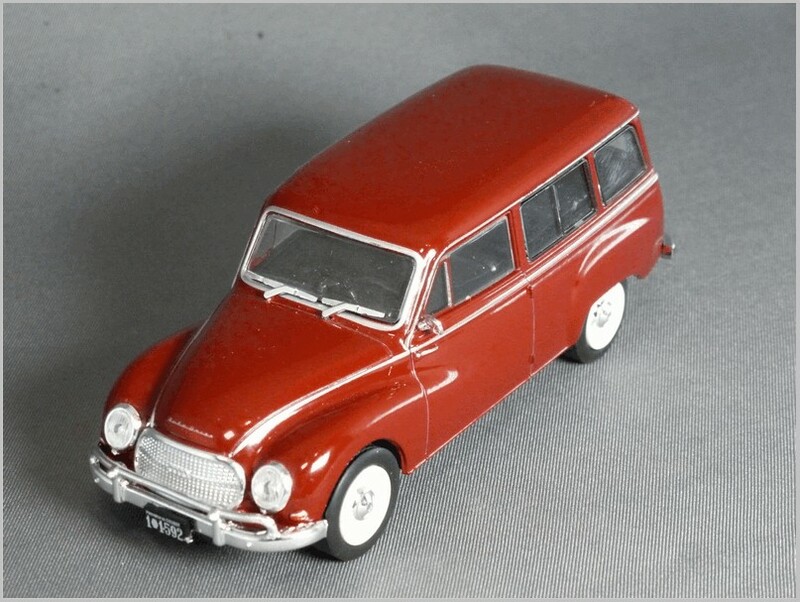 Readers will have seen John Quilter‘s conversions of several of these into American market vehicles, many never modelled previously in 1:43 scale. 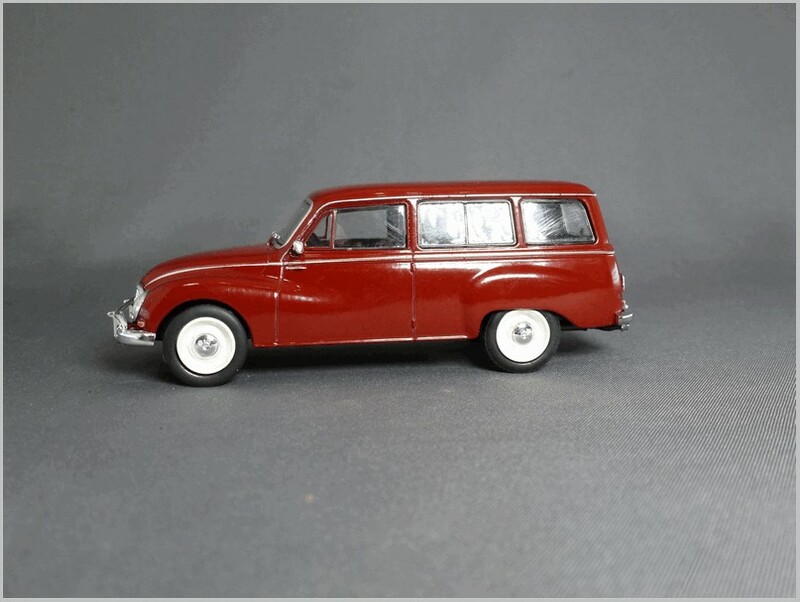 Here we see an Auto Union 1000S Universal estate car which was made in Düsseldorf, Germany, from 1959 to 1962 and was made under licence by IASFe (Industrias Automotriz de Santa Fe) between 1960 and 1970. The name Auto Union was revived for this car which was a development from the 700cc DKW 3=6. It had a larger 1,000cc version of the same two stroke engine and included an autofuel mixer system so the motorist filled up a tank with two-stroke oil as well as one with petrol and the mixing took place in the carburettor. The Auto Union 1000 was sold as luxury compact front-wheel-drive car costing significantly more than a Volkswagen. Once the 1000S was out of production Auto Union lasted only a couple of years more under the ownership of Daimler-Benz before being sold to Volkswagen who used technology from the DKW F102 to lead it in to the front wheel drive era and develop its Audi brand. 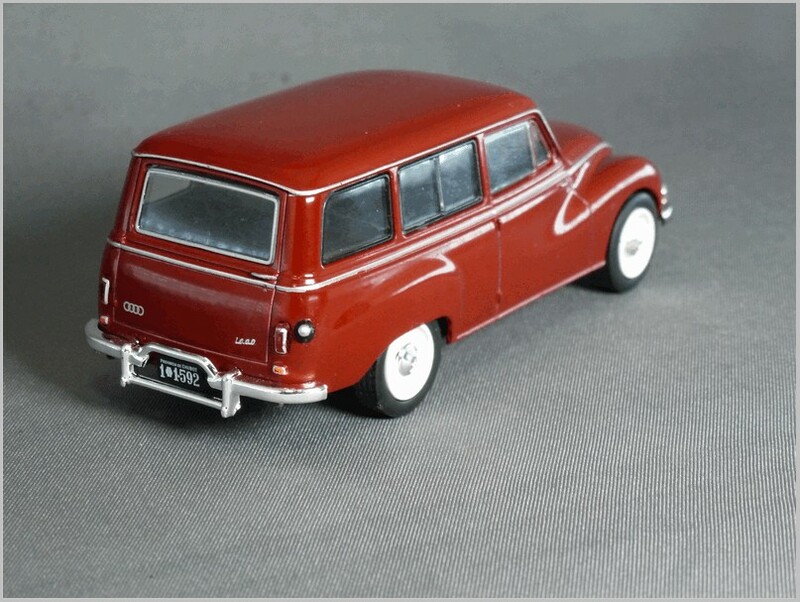 This part work model is nicely made and well up to the standard of the better models made by Oxford Diecast. There appear to be few differences between the German and Argentinian production. At the front the grille is nice though it would benefit from a black wash to tone it down. The lights are typical Ixo style with the peg giving it a visible centre. All bumpers are fitted with extra bars which do not seem to be common on German cars but which might have been an option. The Auto Union script on the bonnet is very fine. The wheels are nicely replicated. The large painted steel wheels with small chrome hubcaps adorn many examples of surviving cars shown on the web. At the rear there are small inserts and the reflectors are well replicated with red paint over a silver base. The Auto Union rings and the 1000 script on the rear door are neatly printed and the fuel filler has been very well modelled with a chrome cap on a black collar. The side chrome strips are mostly fine though on my model the roofline is not without some missed areas. The interior is black and details cannot be seen without a light being used. The steering wheel and dash are moulded in some detail but with no picking out in colour and the door cards have texture and fittings moulded on, but again nothing is picked out. The seats are simply but well moulded. These part work models originally cost very substantial amounts of money imported from South America but now many seem to be shipping from China. 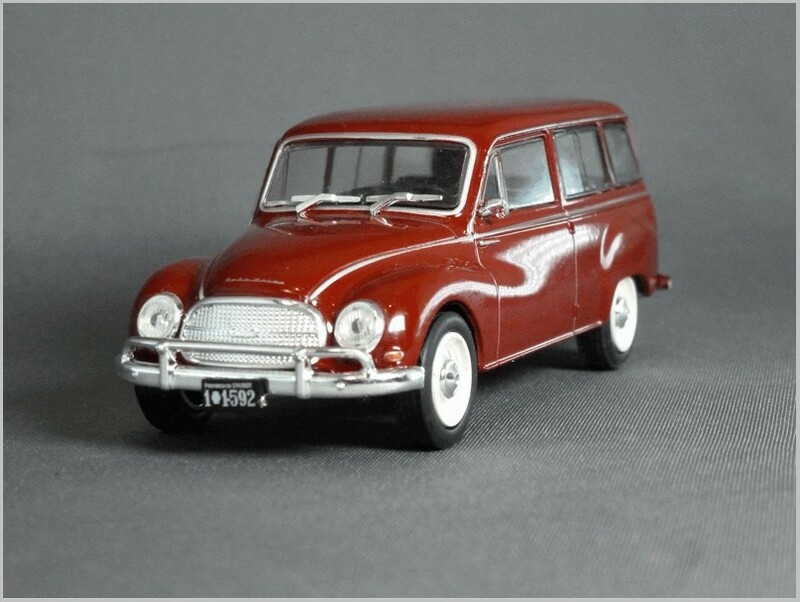 Be warned the price range for these models from eBay sellers is very wide indeed but with care they can be picked up shipped from China for less than the price of a cheaper 1:43 Oxford Diecast here in the UK.